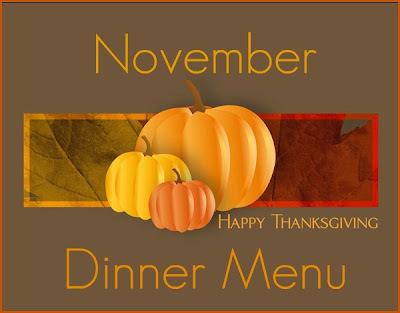 I know Novembers Menu should of been posted last week, but as usual life and chores got in the way. I promise I have been working on it, but getting it typed up and posted was the hard part. Another month is gone and a new one has arrived. I have to say November is one of my favorite months for eats. All those Thanksgiving dishes to be enjoyed as well as visiting with family. 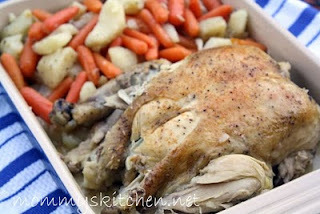 Along with my regular November Dinner Menu I have included our Thanksgiving Meal as well. We will be heading out to my husbands family for the holiday, but I like to have our own little thanksgiving dinner as well. I can't resist because the leftovers are just as good as the big meal. When we go to our families we never get all that. So without further delay here is our menu. I hope everyone finds something to their liking. MMMM...all sounds good! I LOVE Chicken Dorito Casserole! I totally forgot about that recipe, thanks for reminding me of it, I will have to put that on my menu for the week. Just want to say thank you for posting these monthly menus. I've tried weekly menus, and felt like a monthly menu would be overwhelming to plan. I'm on month 3 of the monthly menu after seeing your format. It's been great. Love your recipes. Haven't been disappointed with one yet. Thank you thank you!! You are so welcome. I really don't know what I would do without menu planning in my life. Good for you on doing a month. Great post Tina! You are sooo organized and ready! Everything looks so yummy. Your passion is shining through! What time should I be there for dinner? Sounds delicious! Your crockpot pork carnitas sound interesting. I love Chipotle. Where can I find this recipe? I have been sporatically menu planning, since I first lived with my now-husband. I've dropped back to weekly, because I want to incorperate more fresh veggies, and if I do that it's easier for me to go grocery shopping once a week. I've been posting my weekly menu plans on my blog for 2 weeks now, and my learning journey with it. LoL!